If you’re like the majority of patients, you don’t floss consistently. 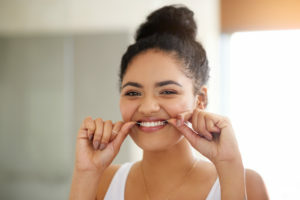 The first few days before and after your six month dental checkups, you probably floss, so you don’t feel guilty when the dentist asks whether or not you’ve been flossing. Unlike tooth brushing and other oral hygiene tasks that have immediate results, the benefits of flossing are delayed. At first, flossing can irritate your gums or feel awkward. Overtime, you’ll start to see improved oral health, but most patients give up after a few days of irritating their gums. In this post, we’ll explain some of the reasons why flossing is such an important part of your preventive dentistry routine to maintain your healthiest smile. Why is Flossing Essential to Oral Health? Have you heard the joke about the patient who asks, “Do I have to floss my teeth,” and the dentist responds, “Just the ones you want to keep?” Maybe not the height of comedy, but the meaning underlying the joke is true. If you don’t floss each day, plaque and tartar builds up between teeth. Overtime, this can cause a number of issues, most often tooth decay (cavities) and gum disease. When you skip your daily flossing, you miss out on cleaning two surfaces of each of your teeth, allowing for the accumulation of decay-causing plaque and tartar. Can I Improve My Flossing Technique? Many patients skip out on flossing because they say it takes too long. When done correctly, you should be able to floss your entire smile in about 30 to 45 seconds. Ask a dentist or hygienist to demonstrate some quick and effective flossing techniques during your next dental checkup. You may also want to consider using a flossing tool or water flosser if you have difficulty maneuvering traditional floss. The type of floss you use really depends on personal preference. If you have widely spaced teeth, you probably want a thicker floss to ensure you’re removing plaque on either side of the space between your teeth. For patients with a crowded smile, a waxed floss or water flosser may be beneficial to ensure the floss can squeeze into the tight spaces between teeth. If you have numerous dental restorations like dental crowns or bridges, you may want to use a water flosser. This ensure you don’t do any accidental damage to your restoration and removes plaque and tartar buildup from difficult to access areas. You should floss at least once every day. Many patients ask us about whether they should floss before or after brushing their teeth. It truthfully doesn’t matter as long as your rinse out your mouth after flossing. Because most patients use fluoridated toothpaste that needs to remain on teeth to strengthen the enamel, flossing before you brush just makes more sense. Mesquite general dentist, Byron McKnight, DDS, MAGD is dedicated to helping patients achieve and maintain their healthiest smiles. With his years of training and commitment to lifelong learning, Dr. McKnight is able to provide his Mesquite dental patients with a wide range of preventive, restorative, and cosmetic dentistry services to help them fall in love with their smiles. If it’s been six months, six years, or sixteen years since your last dental appointment, it’s time to call Dr. McKnight and his Mesquite dental team. We’ll partner with you to achieve and maintain your optimal level of oral health.